Here at The Residences at The Ritz-Carton, Dove Mountain, we stay up on luxury real estate trends. The newest trend to hit the luxury real estate market is anything but fleeting. Virtual Reality (VR) allows homebuyers to tour a property without ever stepping foot through the door—and it’s changing the industry for the better. A closer look at VR reveals how it works and why it’s certainly here to stay. Think beyond the current technologies whereby you can view the interior of a home at the click of a mouse. Virtual Reality tours involve multiple senses—transporting you, the buyer, onto the grounds via laser scans and equipment that captures a full 360 degree view of the home. Through the use of a head-mounted display, head movements are tracked and new images appear instantaneously for a comprehensive three dimensional experience. Sounds can be added in the post-production process to add to the overall illusion. Can you imagine a Virtual Reality showing that includes virtual senses of touch and smell? If it sounds too futuristic to be true, it’s not; advancements to the current technology are already underway. Have questions for the builder? You’ll soon be able to talk to a hologram for real-time inquiries and feedback. As with any new development, criticism follows. Home shopping is still a hands-on process to be certain and one can argue the intrinsic value that comes from a good old fashioned face to face meeting between the realtor and buyer. Fortunately, there’s still room for both Virtual Reality and well, reality, to coexist. What VR will do is clear several roadblocks to fast, efficient home shopping in the luxury real estate market. Developers of luxury homes greatly benefit from VR by allowing potential purchasers and vendors the ability to envision the completed project before construction has even begun. Open houses will no longer be a crowded, uncomfortable scene as all interested parties can view the property at their own convenience. Sellers will reach a wider audience and, in turn, close much faster than before. Overseas investors, active duty military members—even buyers living a few towns over will no longer have to make frequent, expensive travel arrangements for a property in which they may or may not have interest. Virtual Reality home viewings streamline the shopping process and give buyers full control of their luxury real estate experience. Luxury homebuyers will be able to bid on homes immediately; though unlike now where the most competitive markets necessitate “sites unseen,” the buyer will have actually toured the home remotely the moment it’s listed. If the current tech climate is any indication of what’s to come, VR will only get better and more accessible. While it has gained popularity in the luxury real estate market, 360 degree home tours are projected to expand to middle class markets as well. Don’t be surprised if you see unusual marketing efforts emerge as competitors strive to take the technology one step further for maximum listing exposure. Luxury home builders have already incorporated the use of actors and celebrities in VR recordings as an additional selling point (think: Brad Pitt whipping up a salad as you tour the kitchen). Additionally, virtual makeovers are on the rise allowing buyers to customize the home from paint colors to furnishings—even alternate floor plans. Buying a home is not without its pain points—specifically, those factors that inhibit shoppers from ever getting a leg up on the competition. VR technology levels the playing field and removes physical barriers to allow for painless (not to mention—fun) home viewings. Simply have a seat and “walk around”—the future awaits. 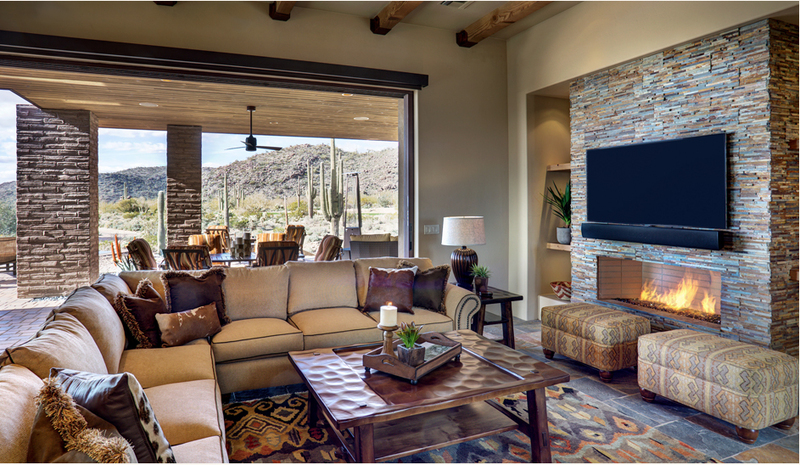 Contact us today to inquire about any of our luxury homes at The Residences at The Ritz-Carlton, Dove Mountain.